A lot of political scientists write their papers in LaTeX these days, and understandably so. Between BibTeX, professional typesetting (love to see the ‘fi’ connected), and symbol options, TeX is certainly better at word processing than Microsoft Word, even if it does create an annoying number of excess files (.log, .aux, .synctex.gz) when you typeset. This slide is a total failure when it comes to conveying information effectively. It is simply filled with what Tufte would call chart junk: a dense table of contents on the left, author information at the bottom (when the author is physically present, this seems unnecessary), and silly graphics in the upper left corner, not to mention three low-res, unidentified, meaningless images. If you look closely, you see that the author’s name appears three times! Another annoying feature endemic to Beamer presentations is the ability to reveal text each line at a time, with the upcoming information visible only slightly, in grayscale. This ‘feature’ only encourages an audience to read ahead and strain their eyes while doing so. A Beamer defender might insist that these design choices are all optional ones; I concede that not every Beamer slide looks this bad. But judging from the presentations I attended at this year’s APSA convention, many do. 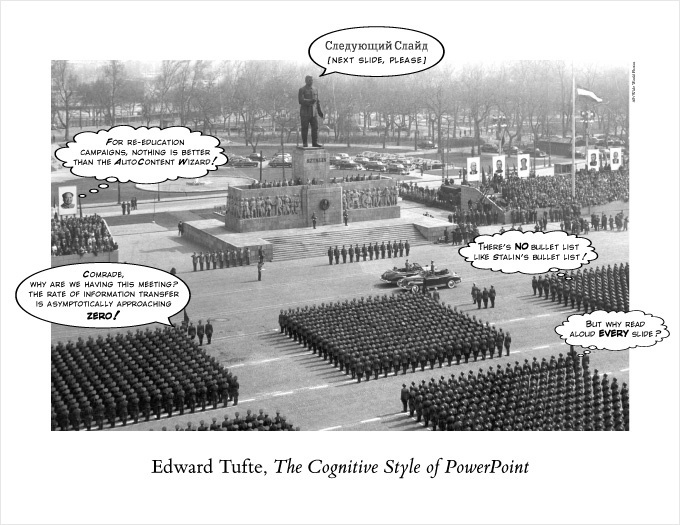 Edward Tufte, in a 2003 pamphlet (unfairly marketed as a book) describes many of the problems endemic to PowerPoint presentations – his criticisms apply even more severely to the visual style of Beamer. While Beamer doesn’t have an auto-content option to generate repetitive, dense, and visually desolate slides (something Tufte despises), it does promote the use of text, and most templates promote text too much. 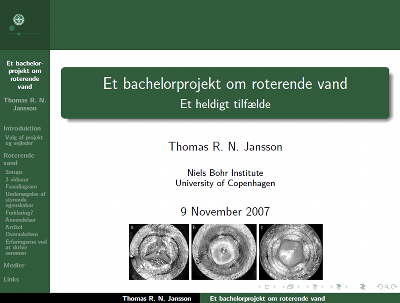 Tufte essentially argues that high density text belongs on a handout – something that audience members can take home, refresh their memory with, and find author contact information with. He argues that projected information should be very simple – the data projector should not be used as anything more than a slide projector. Your graphs and photographs belong on a big screen, but text – of almost any kind – does not. So far I have argued that projected presentations should only feature images – appropriate text should identify, and it should be used extremely sparingly. Beamer can do that, though. But it can’t do everything: there are no bells and whistles, no zoom-in animations, no swirling, flying text. Of course, Tufte also dislikes animations, sounds, and all the other quirky add-ons that Powerpoint features. His logic is simple: they add no information, they clutter the space of the screen (momentarily). But in my experience, a carefully chosen visual stunt is extremely valuable: perhaps it is an ironic way of focusing attention, a bit of humor in an otherwise routine presentation. We are more sophisticated visual consumers than we were in 2003. The ability of powerpoint to move images – in ways that commercials and news reports do regularly – is valuable. It is something that people don’t expect, and it makes those images, once they have settled down, a focal point. Finally, Beamer can’t do video. For anyone interested in visual culture, that sin might be unforgivable.